I never used to like leftovers until I met Ben. There are some leftovers I will not eat like fried foods. Thanksgiving leftovers are the best because you can do a lot of different things with them. This is from a turkey breast I made on Friday night. I had all the ingredients besides the stuff to make the cranberry salsa. I’m never really a fan of cranberry sauce, but this salsa changed my mind about cranberry sauce. It was delicious. Sweet and Spicy at the same time. It would make a great appetizer served with some chips on top of some cream cheese or just good over some turkey breast. These taquitos were really good too. I decided to bake them instead of fry them. The only problem I had with them was the corn tortilla falling apart. I think next time I make these, I’m going to use wonton wrappers instead. The wonton wrappers seem to hold together better than corn tortillas do. You can make these with chicken even if you’re not a turkey fan. A Mexican Thanksgiving sounds like a good idea to me? Doesn’t it. Thanks Melissa. Another good recipe from you that I like. Oh Yah, if baking bake at 450 for about 15 minutes. Use Cooking spray to get the taquitos brown and crisp. Right now I’m watching Food Network’s Thanksgiving special. I’m definitely going to ask for some leftover Turkey next Thursday to make leftovers with. Sweat the onion, garlic, and jalapeno in a saute pan with 1 tablespoon of vegetable oil. Remove from the heat and add to a large bowl. To the bowl, add the shredded turkey, cheese, tomatoes and season with salt, and pepper, to taste. Mix the ingredients thoroughly. Warm the tortillas in the microwave for 10 seconds so they are pliable. 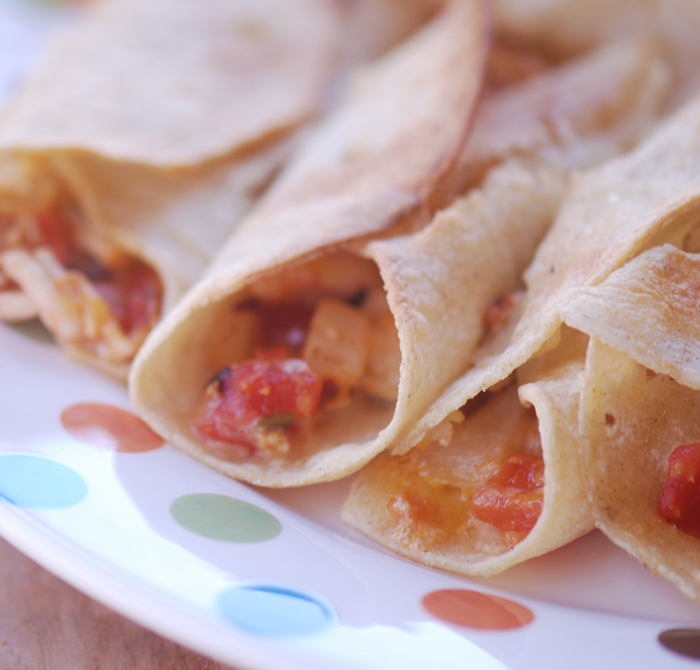 Fill the tortillas with a tablespoon of filling and roll into a thin taquito, securing with a toothpick. Keep the taquitos covered with a damp towel before cooking otherwise the corn tortillas will dry out and crack. Heat 2 cups oil in a straight-sided pan to 350 degrees F. Place the taquitos in the hot oil in batches and shallow fry until crisp, rolling to cook all sides, about 3 minutes. Drain the taquitos on paper towels and salt. Remove the toothpicks before serving. Place the cranberry sauce, cilantro, lime zest, lime juice, jalapeno pepper, onion, red pepper, green pepper, tomatoes, and salt, and pepper, to taste in a food processor and pulse until blended, but still chunky. Serve with Turkey Taquitos.